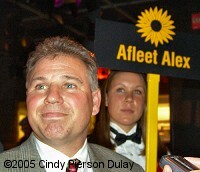 After his narrow loss to Giacomo in the Kentucky Derby where he was third by a length, Afleet Alex was sent off the favorite in the Preakness based on his excellent past performances and his strong morning gallops. He did not disappoint his backers, although they probably had a near heart attack when he almost fell at the head of the stretch after Scrappy T veered out and clipped his heels. 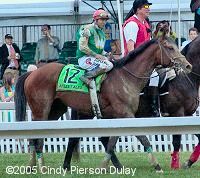 He comes from a family that has been successful in the Preakness in the past, with two previous winners coming from his great-grandsire Mr. Prospector's line (Tank's Prospect in 1985 and War Emblem in 2002). 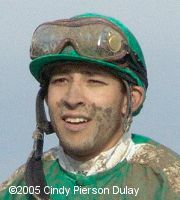 He is the first Preakness winner for his jockey Jeremy Rose, who got his start in Maryland back as an apprentice. 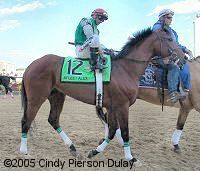 He was the first Preakness starter for his owners, Cash Is King Stable, and the first Preakness winner for his trainer, Tim Ritchey. Unlike most recent Classic winners, he was a well-raced and successful 2-year-old, with wins at Saratoga in the Sanford and Hopeful along with seconds in the Champagne and Breeders' Cup Juvenile. 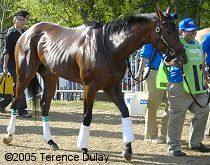 He took the same Arkansas path to the Triple Crown as last year's Preakness winner Smarty Jones, winning the Mountain Valley and Arkansas Derby before finishing third in the Kentucky Derby. The only time he has ever finished worse than third was in the Rebel Stakes at Oaklawn where he was 6th, but later found to be sick. Apparently he recovered nicely. Managing partner Chuck Zacney said after the Preakness, "I mean, what a ride. Less than a year to the Breeder's Cup. Churchill Downs, now the Preakness. Unbelievable. You know, what a dream come true. And that's the one thing we realize how lucky we were and we're very, very thankful, and I got to tell you one thing. We've got to thank all those little angels, boys and girls out there. We have been getting so many cards, emails, we have so much support, thank you very much." 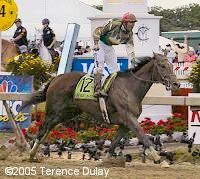 After the Preakness Ritchey said, "I've been a trainer over 30 years, so you put your time in at the small tracks, you finally get an opportunity to find a horse of this ability, believe me, it's the horse. Horses make trainers, trainers don't make horses. I don't care who tells you what. He's the star. And I was just fortunate enough to come across this horse and, you know, it's a little sweeter, probably the fact that it took me 30 years to get here, and I've done it through a lot of cheap races, cheaper horses, a lot of hard times." Rose describing the race, "Around the first turn I tried to get down, on the backside I was about two or three wide, saw a horse trying to make a move to get past on the outside, so I got back in. It was a really well executed trip by Alex for the most part. I just kind of followed his lead. It wasn't so much my athleticism, as it was Alex. He could have very easily went down and we could have been run over by the field." He continued, "When I clipped heels, yeah. I mean, I had enough time to think about hitting the ground, and he popped up back in. I held off on what I had. He came up back underneath me."